The J-100 was General Electric's top of the line table model radio for 1933. 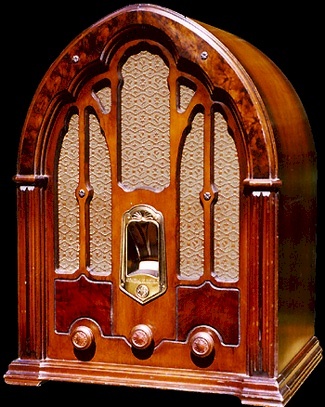 This radio was actually manufactured by RCA-Victor which manufactured its own version as the R-74. The J-100 was essentially a 10 tube console radio chassis housed in an elaborate cathedral cabinet and the whole set weighed in at a hefty 44 pounds. I purchased this set in May of 2000 at the IHRS Spring swap meet which was held in Indianapolis, Indiana. You are visitor number 348 to this page this year.